I, like most good people, have a deep-rooted love of pizza. It could be due to pizza’s presence at almost all birthday parties or sleepovers as a kid, further instilling my love for it linked with happy, fun-filled memories; or simply because its damn good. A good slice is unforgettable to me, possibly by virtue of how rare they were. Somehow an incredibly sincere food was corrupted. The amount of good pizza out there and the amount of people that love pizza is disturbingly disproportionate. I imagine the fact that even bad pizza is, after all, still pizza makes it less offensive. January 3rd changed everything. Yeah, it really did. That’s when my kinship with pizza became a lot less complicated. Before moving to a bigger city (Milwaukee) a really good slice was nearly impossible to find (and my “perfect” slice: totally impossible). And even here once I found truly Good Pizza (Transfer is my favorite), it was still somewhat unattainable due to opportunity and price (contrarily, this recipe costs ~$4 using high quality ingredients). I’d also been making pizza at home for years with disappointing outcomes despite real effort and always trying new things. Until January 3rd anyway. 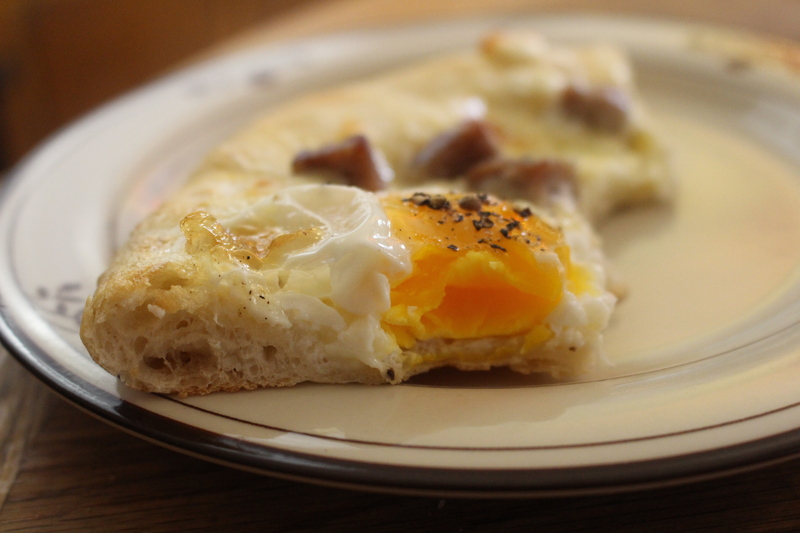 I credit this breakfast pizza specifically for my ability to finally make delicious homemade pies mainly because it was one of the first times I ditched the beloved tomato sauce. In my experience, since being cooked at only around 550 degrees (more on that in a minute), by the time the crust was cooked it had already turned into a sad, weighted down wreck by the tomatoes. Just a thin brushing of roasted garlic butter instead consistently produces a crispy, yet airy, covetable crust. If you don’t want to give up tomato and get good results anyways, using uncooked (so that it’s still bright and thin) tomato is all you need. When they’re in season, simply blend them whole with a bit of garlic, basil and olive oil. When they’re not in season, go for canned San Marzanos. They’re a little more expensive, but especially for pizza, no other tomato variety compares. The second biggest thing is I finally stopped adding olive oil to the crust. I never added much, less than 2 tablespoons, hoping it’d lend its flavor to the crust (I’m talking about high quality oils that are so delicious you can sip them straight from the bottle) but I’d always end up with a heavy, compact dough. My flour/water ratio ensures the dough comes together quickly and clean, but if you find it protesting a bit I do recommend using oil (~1 tsp) to work it out vs extra flour while kneading to keep it springy. I’ve topped pizzas with an unbelievable list of bizarre things, yet never regrettably. I’ve had butternut squash with spicy pomegranate salsa pizzas, ones covered in dandelion greens, entirely in root vegetables or ramen inspired ones in bean sprouts and pickled lemongrass. Pizza is beautiful. All you need is some flour and cheese, the rest is up to daydreams and whats in your fridge. Once you step away from rigid, conventional toppings, not only will you love pizza even more, but you’ll realize its certainly possible it loves you back. Some things require some experimentation or prior cooking, but I feel topping a pizza is pretty intuitive. Hardy greens, like one of my favorite toppings (kale), belong under the cheese so they’re able to abandon their plucky, fibrous nature without becoming dried to dust. The fat from the cheese cooks it perfectly, to the point it seamlessly blends; you’ll hardly know it’s there. It goes so well even a kale-hater (if they exist?) would say “YOU KNOW WHAT? THAT WAS REALLY GOOD” And, yeah, it is really good. More tender greens (like arugula, sprouts or herbs) go on after the pizza is done cooking. Arguably the most crucial part to making good pizza is temperature. Traditionally pizza is cooked in brick ovens between 800-1200 degrees, but ours (and likely yours, unless you’ve rigged it to run in the self-clean cycle) tops out at 550. You really shouldn’t bother cooking pizza at a temperature lower than the maximum your oven can produce, the heat is needed to quickly cook the crust before it has a chance to dry out. Due to the lower temperature, it’s recommended to use flour with a higher gluten content (like bread flour) but I’ve gotten respectable results from good ol’ AP. Combine all ingredients in a medium bowl. Just barely mix and let sit for 20 minutes for the flour to hydrate (called autolyse, something I learned and liked the results from when making french breads). Lightly oil your hands and knead the dough until completely incorporated, smooth and elastic. If necessary, use extra flour very sparingly. Let rise ~2 hours, covered with a damp towel, until a 50% increase in size. Avoid using a rolling pin as much as possible and instead gently pull on it to shape it. I like to form it into a ball, use a rolling pin to form it into a small circle (about 4 inches across) and then hold it in the air, spinning it with two hands, and let gravity pull it. If you have time, make the dough 1-4 days ahead of time and store it in the fridge. Use just 1/2 tsp of yeast. The cool temperature will prevent the dough from rising like crazy while developing a substantial flavor. Preheat oven to 550 or however high your oven will go 20 minutes before assembling your pizza. Roll out pizza dough. Melt garlic butter so that it’s easier to spread a very thin layer of. Brush it all over the dough, paying special attention to the very edge. Shred enough cheese to cover entire pizza in one layer. Grab a small bowl, or over the compost, crack your egg and discard about 1/2 of the egg white. Carefully place the remaining egg white/yolk on the pizza and cover with salt and pepper. Arrange the red onion and bell pepper evenly over the pizza, using more or less to preference. Top with parsley and green onions immediately after removing from the oven.